On days like these I wish I had a butler. Work ist overwhelming and the household screams for attention: laundry, cooking, cleaning. Here a small thing to do, there a phone call and then a cat starts to suffocate on it’s daily fur ball. Yes, a butler really would be perfect! The laundry would be so much softer and it would smell much more nicely than I could ever manage to achieve. The food would be splendid and extraordinary, every single day. Our home would be polished to perfection and tidied up – no grain of dust, not a single cat hair in every corner or under the couch. I wouldn’t need to worry about anything, except for doing my work and live as I like. Whenever I want to, I could have a nice cup of tea and for that I would just have to ring a bell. What would I give for such a helper…! But then glowing red eyes come to my mind. Pitch black hair and a cynical smile and my heart turns cold. I would have to name my butler Sebastian and in return for his service he would take nothing more than my soul. Of course, the tea would be extraordinary tasty: chosen well and brewed to perfection! And I wouldn’t have to mind anything at all anymore, except for my little soul, because – let’s face it – this guy is a natural all-rounder! And also, he is a cat person. But still… I’d much rather go back to my chaotic, demon-free life and indulge in a big bowl of self cooked donburi in the evening: a traditional Japanese dish, consisting of a bowl of rice, topped with something delicious of my choice. 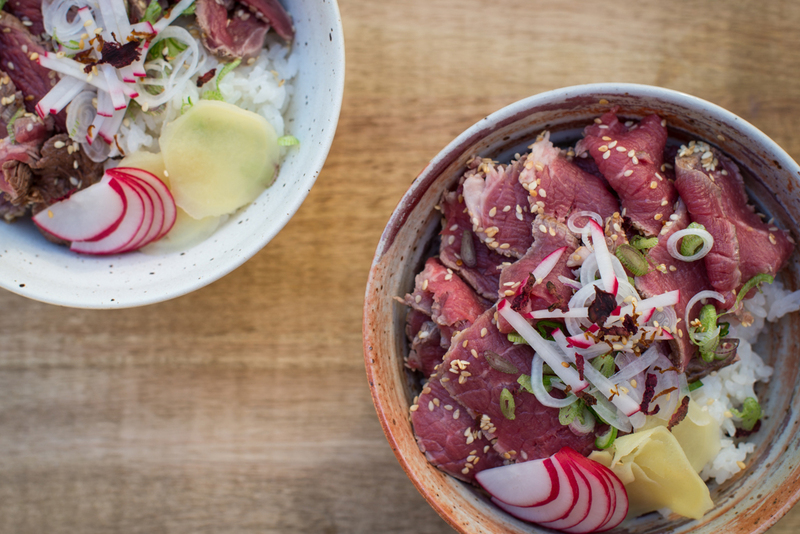 And because these red eyes just won’t go out of my head and we deserve it after a hard day’s work, I put a a big portion of Gyu Tataki onto our rice: briefly and hot seared beef, cut into thin slices – almost like the Italian carpaccio. And just because it’s today it will be the best of the best: a piece of fillet of a happy, life-blessed cow from the Swabian Alb. I will serve that meal to my Mr Zuckerwatte and myself in the warming evening sun under an open, blue sky with our souls free as a bird. And whilst glaring into our (way to fast emptied) bowls we will happily sigh: Life is good! A little bit of chaos won’t hurt. Steam the rice in a rice cooker or pot. Put the sesame in a pan and let it roast a little bit under medium heat until slightly golden-brown. 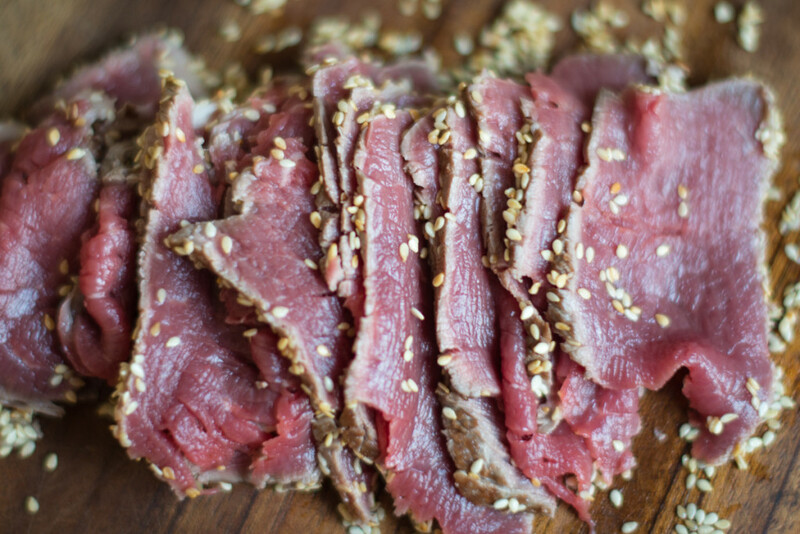 Meanwhile cut remaining fibres from the beef, wash it and pat it dry with a kitchen towel. Pour the rice vinegar, gari su and soy sauce into a pot and let it gently boil down to half the amount. Remove the pot from the stove. Wash the spring onion and radish and finely cut them into stripes or slices. Fill a bowl with ice cubes and add a little bit of cold water. Get the sesame out of the pan and onto a plate, put the pan back on the stove and heat it up. Pour in the oil, add the beef loin and sear it briefly from each side. It shouldn’t stay longer in the pan than 1-2 minutes tops! Get the fillet out of the pan and immediately put in into the ice water to stop the cooking process. Fish it out and turn it over in the sesame. Let it rest for a minute. Divide the rice into two bowls. 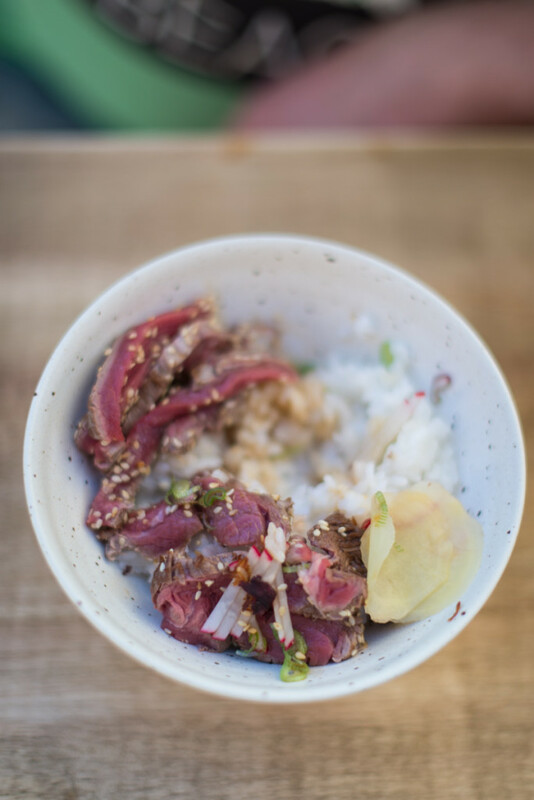 Finely cut the beef into thin slices, arrange them on the rice. 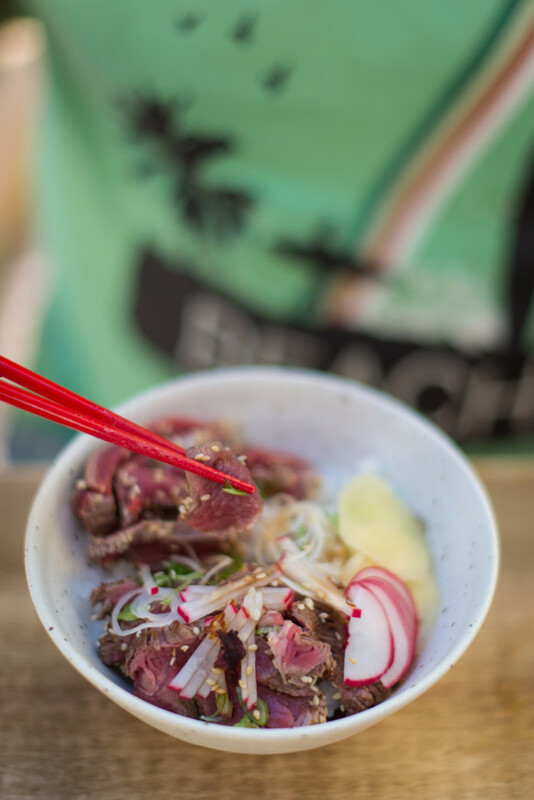 Garnish the bowls with spring onion, radish, gari and furikake, pour a little bit of the sauce and a few drops of sesame oil over it and serve.